There are a number of places you’ll want to check first if your roof is leaking but if you’re not a trained roofer, checking your roof for leaks can be a demanding task. Save yourself some time by checking the most common areas of your roof to suffer from leaks. Some parts of your roof are more vulnerable to leaks than others so to save time, check areas where one surface meets another, called penetrations – such as roof vents plumbing and chimneys, which penetrate the roof. Check areas such as lead flashings, where it’s common for the seal to become damaged over time. Your chimneys are a prime spot for damage. As well as worn lead flashings, there’s brickwork that could be many decades old and which naturally erodes over time. Flashings can also begin to rust or come away, allowing water to trickle through your roof and potentially damage to integrity of your whole roof if you leave it too long. The perimeter of your roof takes most of the brunt from winds as they blow across the surface, so when you’re checking your roof for leaks, make sure you look at these areas too. There are weak spots around the edges of the roof and the underside of your roofing, where the two materials meet, so keep an eye on this area for signs of wear and tear. Check your roof drain – this can often contain water that’s pooled up with rainwater. This effect is called ponding, which can cause trouble over time. Make sure that your roof drain is working effectively, allowing water to drain from the rooftop, by cleaning it regularly. Purchase a screen which will keep the drain free of debris – this is particularly important if you life in a leafy area, where leaves can clog up the system and cause standing water to back up on your rooftop and cause damage to your roofing. If you have any accessories on your roof, try to have them in the same material as the roof itself as this will make it more effective in protecting your property from the weather. Also important is to keep your gutters working well so that water can flow properly from your rooftop. You should try to keep your guttering free of debris by having them cleaned at least once a year. Try to do this before winter, when water can turn to ice and could cause your gutters to crack leading to you needing replacement guttering. You can perform a check on the outside of your property, looking for damaged slates and tiles. Look for shingles that have curled up or are loose, which can allow water to penetrate inside your property. You may be able to do this from the ground, using binoculars. It’s often easy enough to spot water damage inside your property. It could be chipping paint on the ceiling, water spots, dark marks and mould. There may be rusting metal work or timber that has rotted. Although you can see where the damage is, it can be difficult to find the corresponding leak because the water may have run down the roof before becoming noticeable. You should be able to follow the course of the water to find out where the leaking spot is in your roof. You can also try noting where the water damage is in relation to a spot on your roof, such as the chimney, so that you’ll be able to guess the proximity of the leak when you’re fixing it outside. If water has been allowed to run down through your roof, the damage may be more extensive than you thought at first, because there may be damage along the whole course of the water, where it has entered and run down. It’s important to get the damage fixed quickly by a professional roofer straight away so that if there is a leak in your roof, it doesn’t lead to further problems down the line. Even small holes – where you’ve had a satellite dish, for example – can cause big problems later on. Over time, a small leak can compromise the stability of your whole roof if you don’t have the problem fixed. 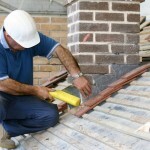 If you’re not too handy at DIY, it may be best to call a competent roofer. A trained roofer will know what signs to look for when checking your roof for leaks. They’ll be able to carry out professional roof repairs to set your mind at ease that your roof is secure and safe from the elements. Call G&A Roofing and Building for a trained roofer today. We are a leading roofing firm that deals with all aspects of roofing work, including emergency roofing, guttering work and chimney maintenance. Contact our experienced roofers for help today on 0800 626430. This entry was posted in How To Roofing Blogs and tagged damage, leeking, leeks, roofer, roofs. Bookmark the permalink.